In Fiji native communities are the custodians of 87% of land area and of all the coastal and marine environments up to 12 miles offshore. The Government entrusts hands-on management of terrestrial and coastal resources to local communities. The latter need therefore to be sufficiently skilled and technically equipped to be in an informed position when deciding on how to manage their territories. The regulatory, legal and cultural frameworks are supportive for native communities to take the lead in managing their resources. Nonetheless actual implementation depends on a number of contributing factors the occurrence of which is varied. Typically local knowledge is scattered and invisible or partially shared. Historic data on the occurrence of resources is transferred orally or in a manner, which is not conducive to systematic monitoring or detailed planning. Data available at government level are frequently of poor quality, outdated or incomplete. While some effort has been done by NGOs and government agencies to introduce participatory planning and monitoring methods, most village communities still rely on traditional gatherings where conversation is used as the main channel of communication. The use of community-based geo-spatial information gathering and analysis tools as supports to informed decision making was still in its infancy when this initiative took place in year 2005. Local knowledge was and still is scattered in the mind of individuals and rarely collated, geo-referenced and visualised in the form of maps. As mapping is a fundamental way for displaying spatial human cognition and for communicating on issues related to the territory, the lack of a best practice for producing community-generated maps hampers increased involvement of the grassroots in decision-making, a critical ingredient when natural resources distributed over vast areas are at stake. As of the year 2005 several attempts had been made by Government and NGOs to support communities in implementing participatory planning processes and some experience had been gained in this domain. PRA tools were used to engage community members in identifying and analysing perceived proble ms and conceptualising necessary actions. 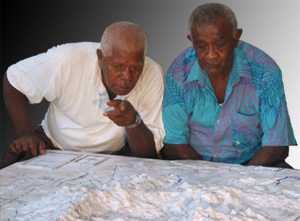 Transect walks or manta tow surveys, sketch mapping and other diagramming methods were used in Fiji and elsewhere in the South Pacific to enable villagers depict their spatial knowledge in terms of resource location and use. Success using these methods had been variable. 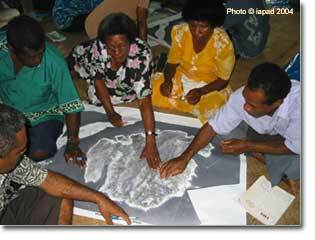 In 2004 Fiji the University of the South Pacific (USP) introduced a method known as participatory ortho-photo-mapping which proved to be efficient in extracting information, but not sufficiently user-friendly to enable informants to master generated data and use these for planning purposes without support and “intermediation” provided by outside institutions. This realisation raised legitimate questions on who would actually “own and control” local knowledge and on whether the method would in practice empower or disempower participating communities.